I walked back quickly and grabbed her hand and did that walk you see parents do with their kids when they are in a hurry. I basically drug Gabby with me to catch up to the other girls. Again no real reason, no need to rush through life, just the way I was … had to move and keep going. A week or so later Gabby would be diagnosed with Cancer, diagnosed and said to be terminal. A week or so later we were told our 5 year old would die in the next few months. The reason she was going slower is her balance was off. She was having trouble walking without fear I would guess. But that’s the thing… I didn’t guess, and I never asked. If you look at the picture her mouth is full. She was still chewing food she had eaten about an hour earlier. This had been going on for a week or so. She would keep chewing her food till we told her to spit it out. We thought it was a phase, something she would outgrow. A week or so later after diagnosis we would learn the type of Cancer she had affected her secretions. She couldn’t swallow correctly. Imagine eating a box of crackers or a loaf of bread with nothing to drink or a dry mouth. Welcome to what Gabby experienced. Again we didn’t ask, we didn’t know. Tomorrow 10/9/2013 is Carolynn and my 14th anniversary. We were married on 10/9/1999. Six years later on 10/9/2005 we would have a small little blonde angel named Gabriella. That’s right Gabby was born on our anniversary. She always loved making an entrance. On that day if you watch the video Six Candles and no Cake on YouTube you’ll hear Carolynn say “ She will always be the baby” How true those words would turn out to be. I don’t write this for pity, believe me it’s not what I need or what I am looking for. I recently talked to a person who really helped me get through the days when Gabby got sick. She had the perfect response: sometimes relationships end. I might not have gotten that totally correct but hopefully you get the idea. No different than a marriage or a boyfriend or girlfriend. Sometimes you just outgrow the other and need to move on. I have beaten myself up over and over, started to believe maybe I was the reason we have lost these people. But I’ve come to realize I’m not. I don’t believe I have the right to do anything I want and hurt anyone I want just because I lost a daughter. However I do believe I am entitled to sometimes act or say things that may be deemed irrational at times and have the support of people who understand that. How would you act when the impossible happened to you? When you wake up and realize you buried one of your children? So many people told me how powerful my blogs were until I said something that they thought affected them. I regret many things daily that I did or didn’t do with Gabby, I regret that I never bought her that football jersey I always said I would get” next Christmas” I regret not playing with her when she asked me to the day before her diagnosis because I was playing Xbox. Do you want to get an idea of what goes through my mind any given day? Two days ago I was driving to work, I started thinking about a store back where we used to live, that flowed into thinking about a time I took Maddie, Katie and Gabby to that store. They would buy gifts for each other, Carolynn, and I there with their own money because it was an inexpensive store. That flowed into the last Christmas we had with Gabby. She ran around that store with a red football under her shirt hiding it from me before she paid for it so I wouldn’t see it. So I would be surprised, I remember having to beg the clerk to let us use the employee bathroom because Gabby had to go so bad she was near tears. Then I remembered that football was in the garage, I remembered I don’t think I ever threw it to her. I cried the rest of the way to work, I’m crying now. That is just one of thousands of memories that replay in my head. And that’s over three years old. So no I’m not sorry someone is upset I called them out or used something they did as an example of how things have changed due to cancer, Not because I don’t care, but because I’m so exhausted replaying everything else that I just can’t seem to manage some days. Please don’t take this as an insult. I’m not strong, and I don’t think I could be strong enough to do it either. We hear people say all the time “ You are so strong and brave” The truth is we are neither. All we are is doing what we have to, we have no choice. I would much rather crawl in a hole some days. But I have two other daughters, a son and a cause. The Foundation, a way to keep my daughters name alive forever. To make sure in her name we make a difference. A relative who no longer speaks to me told me that Carolynn and I didn’t care about children. My only response is that’s all we do anymore. This foundation is completely a volunteer position. It’s the reason Carolynn and the girls were gone four days last week at a foundation event, It’s the reason all of us will be away from home at another foundation event this entire upcoming weekend. So no we aren’t strong, but our mission in life now is to make a difference, to help other kids. Gabby didn’t Get Well, but in her name other kids will. So I want to forgive all of those people, I want to thank them for the time and effort they demonstrated sticking by us as long as they did. I want to say I understand. In one very dark blog right after Gabby died I told a story about how when we were sitting in the hospital I told Carolynn I would trade every kid and person in this hospital for Gabby to be okay. It’s an absolutely horrible thing to say, I know that, It’s not rational, but I said it, I don’t regret it, I was weak, I am weak and to this day I’m sorry but I would. If that makes me a horrible person then so be it. I would never wish this on anyone but the reason for this blog was to write thoughts like these down so others going through it might just not feel alone. Its basically just part of the bargaining phase of grief in my opinion. 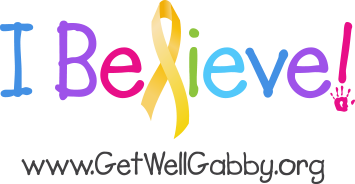 The point I’m trying to make is this: My family and I have decided to dedicate every free moment we have to running The Get Well Gabby Foundation. We will continue to do so. We owe so many people so many thanks and we do thank you all. No matter if you are still by our sides or not, Thank You. I hope you all accept this gift because it is genuine and from the heart. I need to go on, move on, survive and keep fighting for these other children, keep fighting for these other families. Holding on to the anger and resentment just got too heavy. It is time to let it go. So on the eve of what would have been Gabbys 8th Birthday I say to you all: Thank you and I understand.